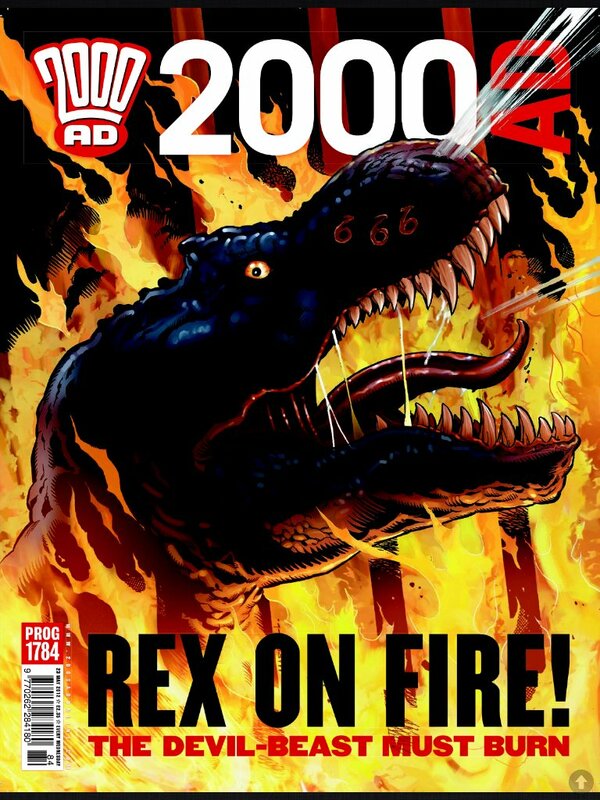 2000AD continues the fire theme with Gorehead raising hell on the front cover! Judge Dredd, Day of Chaos: Eve of Destruction starts of the fire theme with the Judges trying to get to grips with the Chaos Bug. There’s no sign of the Dark Judges at all here, but we know they are just biding their time. The chaos, madness and fire is well represented here and you just get a good feeling on how frantic everything is! Part 11 of Flesh: Midnight Cowboys is in black and white, but the fire and danger is no less graphic. McG’s reaction in the third to last panel is excellent, and you know that there is going to be a violent conclusion to this series! Talking of conclusions, part 10 of The Zaucer of Zilk brings us an excellent and surreal conclusion – much like the rest of the series! The changes in the art from light to dark and back are excellent and the final page spread rounds up the whole tale. I wonder if there is more to see from Zilk? Instead of another Timetwister, we get Terror Tales: Kitsuneland which sets itself up brilliantly in the first page. I would comment that the art is a little too dark in places, but otherwise, you’ve got a story which may put me off theme parks! The ‘reveal’ on the last page kept drawing me towards it! Part five of Cadet Anderson: Algol has the lead confirming my suspicions along with the lead character. This is a nice smooth finish to the series and it looks as if we are coming close to the end of Anderson’s adventure here.